The closest planetary conjunction of the year graced the skies this morning, and astrophotographers were out in force to marvel at the beauty. The duo were just 11.9’ apart, less than half the diameter of a Full Moon. Also joining the view was M44, the Beehive Cluster. We start with this gorgeous shot from Queensland, Australia by one of our longtime favorite astrophotographers, Joseph Brimacombe. 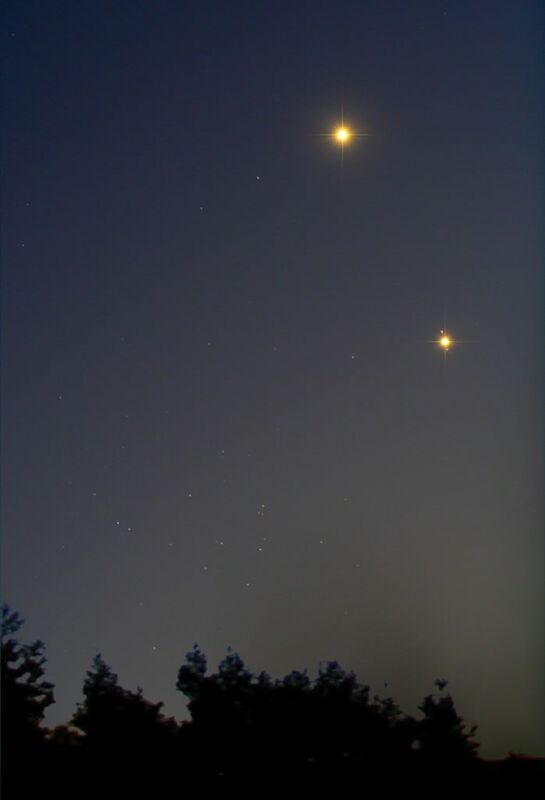 The Jupiter and Venus conjunction on August 18, 2014 along with the Beehive Cluster. Credit and copyright: Tom Wildoner. Telescopic view of Venus and Jupiter in the morning sky over Lahore, Pakistan. Shot with a Nikon D5100. Credit and copyright: Roshaan Bukhari. Jupiter-Venus-M44 conjunction on August 18, 2014. Image taken with Canon EOS 50D, through Skywatcher ED80. Credit and copyright: Zoran Novak. Close approach of Venus and Jupiter with M44 in the same field on August 18, 2014 over Payson, Arizona. Shot with a Canon XTi DSLR, 5 seconds exposure, ISO 400, 4″ f/4.5 Newtonian. Credit and copyright: Chris Schur. Conjunction between the planets Venus(top) and Jupiter (bottom) as seen from London just before dawn on 18th August 2014. Credit and copyright: Roger Hutchinson. captured at twilight on an 18 day old moon, one can see the two planets less than 1 degree apart in the sky. This image was captured at Damdama Lake, Haryana, India. Credit and copyright: Rishabh Jain. When Venus and Jupiter were almost touching in the sky! August 18, 2014 over Königswinter-Heisterbacherrott in Germany. Credit and copyright: Daniel Fischer. Venus and Jupiter 1/2 degree apart low in the pink twilight at lower left, with the waning crescent Moon near Aldebaran at upper right, taken from Alberta Canada on August 18, 2014 at dawn, looking due east. This is a single 1 second exposure at f/4 with the 16-35mm lens and Canon 6D at ISO 800. Credit and copyright: Alan Dyer/Amazing Sky Photography. Venus-Saturn conjunction on August 18, 2014, as see from Topaz Lake on the California – Nevada border. Credit and copyright: Jeff Sullivan/Jeff Sullivan Photography. A sample of four images in various locations/moments at Pescara, Italy. Credit and copyright: Marco Di Lorenzo. A great set of photos. The first one would make a great wall photo. Chris Schur’s over Payson showing M44, so aptly named the Beehive.